The one thing I can tell you about the GLA 250 before we even get into it is that it is not an SUV. The funny thing is that Mercedes classifies it as one. So what do we have here? 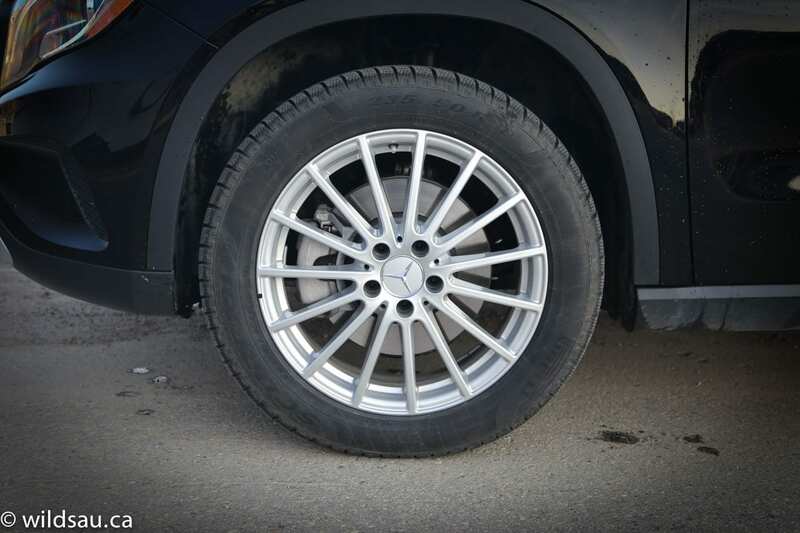 Well, as I said, Mercedes hilariously calls this an SUV – check out their website for proof. It’s obviously a crossover, and it’s actually the same platform that you’ll find a B 250 and a CLA 250 on. At first, I found the GLA a bit ungainly as if some of the proportions were wrong but I couldn’t put my finger on it. After a day or so, it started growing on me. And at the end of the week, I didn’t mind it at all. I thought it looked confident and little bit athletic without trying too hard. It’s got some ground clearance, and it has short overhangs, especially in the rear. The sides are sculpted – quite dramatically, as a matter of fact. The aggressive snoot with its handsome Bi-Xenon headlights, signature LED driving lights and brushed-steel-looking lower trim says “I can go off-road, you guys – but not too far” and the rear end sports its own interesting sculpting, LED light strips, integrated exhaust tips and a little faux skid plate that also says “I’m tougher than a normal hatchback”. My sample had pretty 18-inch rims that filled the wheel wells nicely. A lot of people came up to ask about the GLA and almost invariably, the styling and size resonated with onlookers – so Mercedes seems to have gotten it right. And people sure loved the Nocturnal Black the review car came in. If you’ve been in a B-class or in a CLA in the last couple of years, the cabin will feel quite familiar. There are minor differences between all of them, of course, but they’re all the same vehicle underneath, and they all share a large number of features inside. Materials are nice, with nearly any surface you contact being textured soft-touch plastic, but I found it pretty dark for the most part. 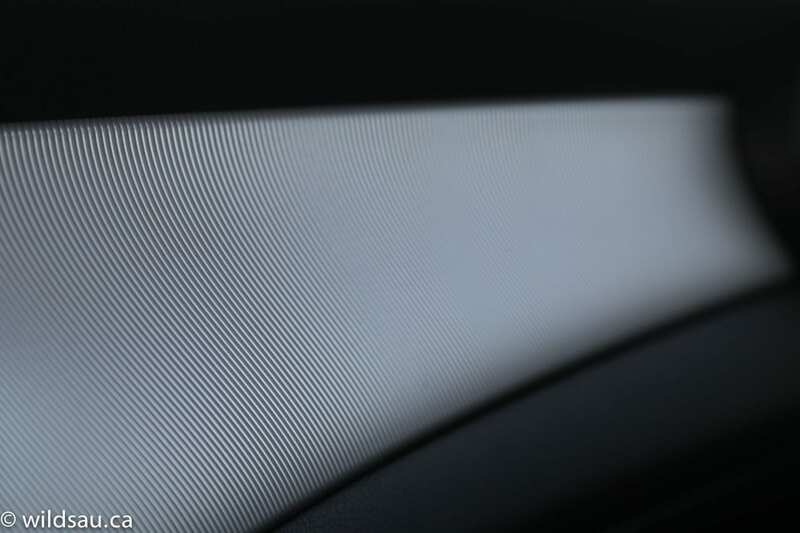 The striated metallic trim piece on the dash is very distracting and if you stare at it, which you obviously will, it could easily transport you to another dimension. Fit and finish appears to be excellent, and the car felt very well put together. The front seats, upholstered in ARTICO leather, heated and power-adjustable (with 3 memory settings for driver as well as for the passenger!) are pretty comfortable and pretty supportively bolstered – although I’d prefer a bit more of each. Head room was just enough for me, but is certainly diminished versus the B-class. 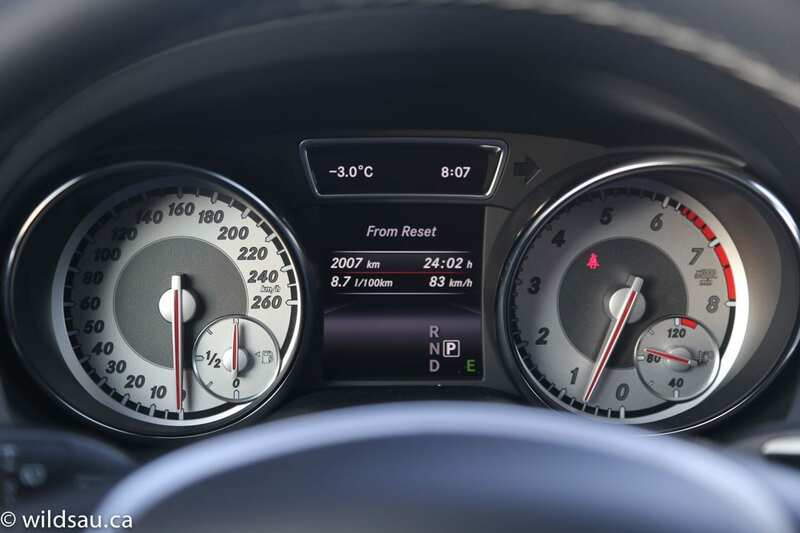 The gauges are easy to read and are separated by a beautiful, sharp driver information screen. 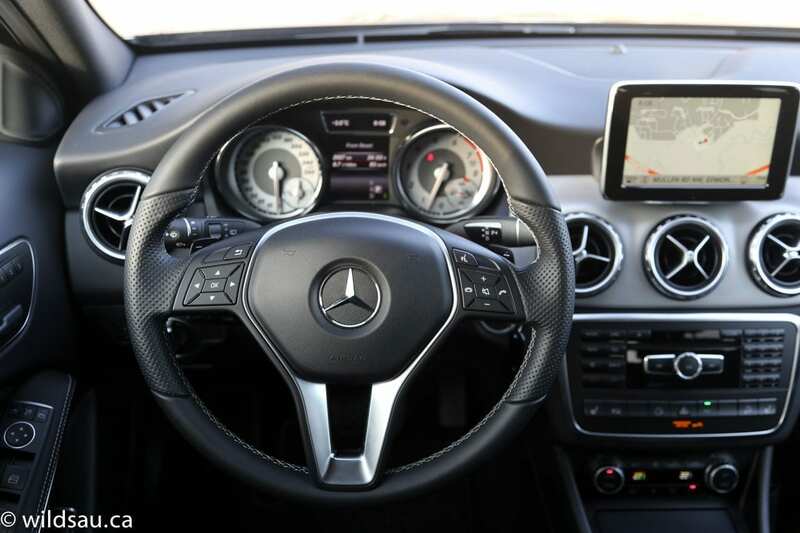 And the steering wheel is one of the best I’ve used in a while – perfectly sculpted, comfortable and sporty. 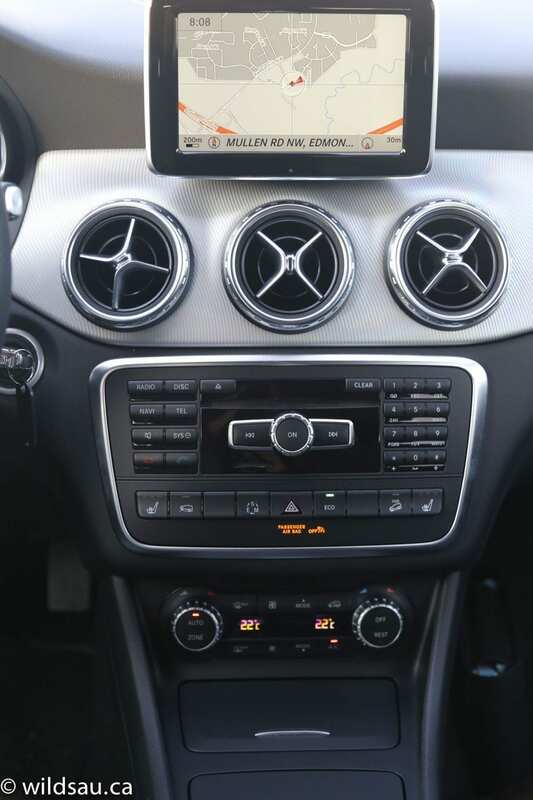 The GLA’s COMAND system integrates a high-mounted 7-inch screen and a rotary joystick knob as an input device, and once you’re used to it, works pretty well. 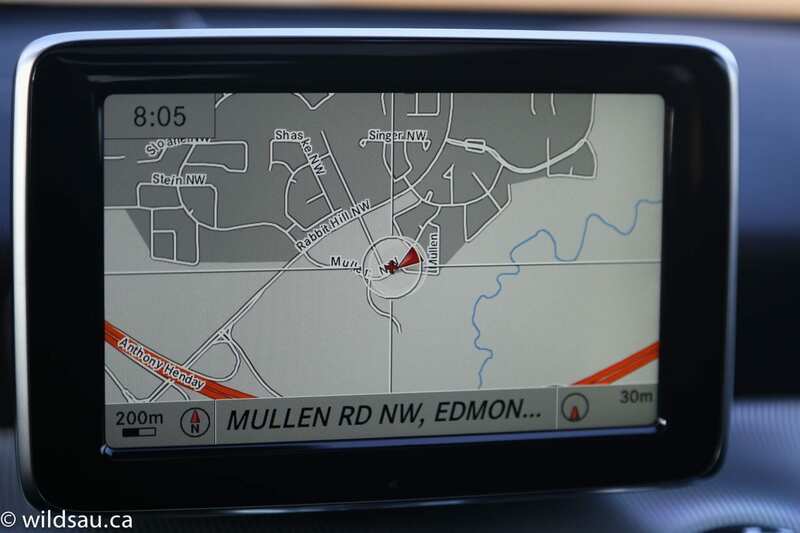 It takes care of all the audio, phone, navigation and vehicle settings. There’s an automatic climate control system as well. I really enjoyed the massive dual-paned panoramic sunroof overhead and found that the power-folding mirrors were a nice touch. There’s quite a bit of driver assistance technology here, most of it being invisible and not very intrusive – blind spot monitoring, active parking assist, collision prevention assist, attention assist (as if I’ll pay attention to that flashing coffee cup on the dash when I’m sleeping) and a back-up camera. One major ergonomic niggle – the cruise control stalk is completely hidden behind the steering wheel, which makes using it an exercise in stretching and gawking over the wheel to see the markings on it, unless you’re familiar with its functions. 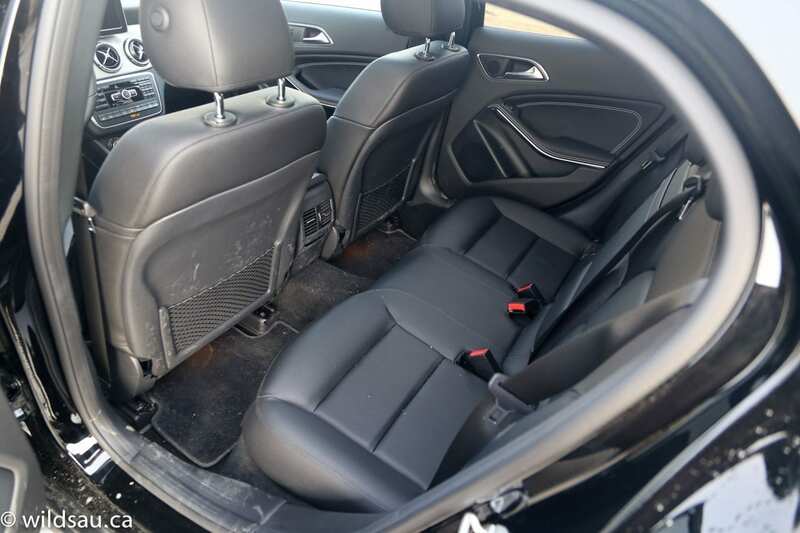 The rear seats are relatively comfortable, though the middle position won’t be a happy place for an adult thanks to the huge floor tunnel. Leg room is fine but head room in the back is limited for adults – taller folks will be messing up their hair in the back of a GLA. There are some adjustable air vents, and a 12V plug – along with a handy ashtray. Our three children were fine in the back, and if you need to put seats in for the tiny people, you’ll find two sets of excellent ISOFIX anchors. There are a few places to put your stuff around the cabin, including a couple of varied cupholders in the console and little bins here and there. The trunk is accessed behind the powered lift-gate. It’s a bit smaller than the more efficiently-packaged B-class, but at 421 litres, it’s similarly sized and is a highly usable space. 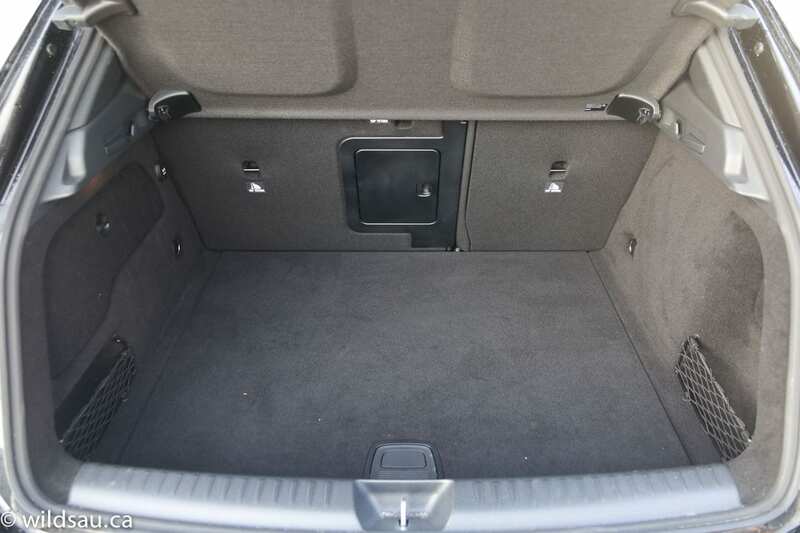 Fold the rear seats down for plenty of room (1235 litres). The seats fold in a typical 60/40 split for flexibility. There’s a 12V plug in the back, as well as a couple of very solid-feeling tie-down hooks and some handy bag hooks on the sides. Mercedes’ little 4-cylinder, a turbocharged 2.0-litre, is finding its way into all the entry-level models – the B, the CLA and now the GLA. 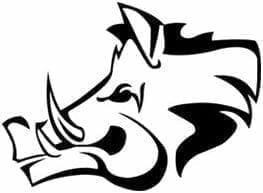 It’s a great little engine, putting out 208 horsepower at 5500 RPM and 258 lb.ft of torque at a very low 1250 RPM. 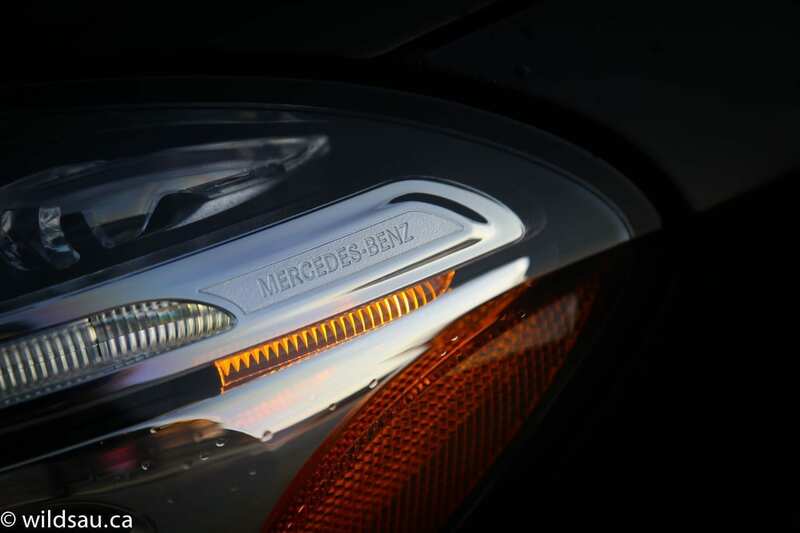 The GLA gets a modern dual-clutch 7-speed automatic and permanent all-wheel drive. Fuel economy is decent and is rated at 9.8 L/100 km (24 US mpg) in town and 7.4 L/100 km (32 US mpg) on the highway. We ended up averaging 8.7 L/100 km (27 US mpg) during our week with it, where we tacked on a tad more highway mileage than a typical review week. 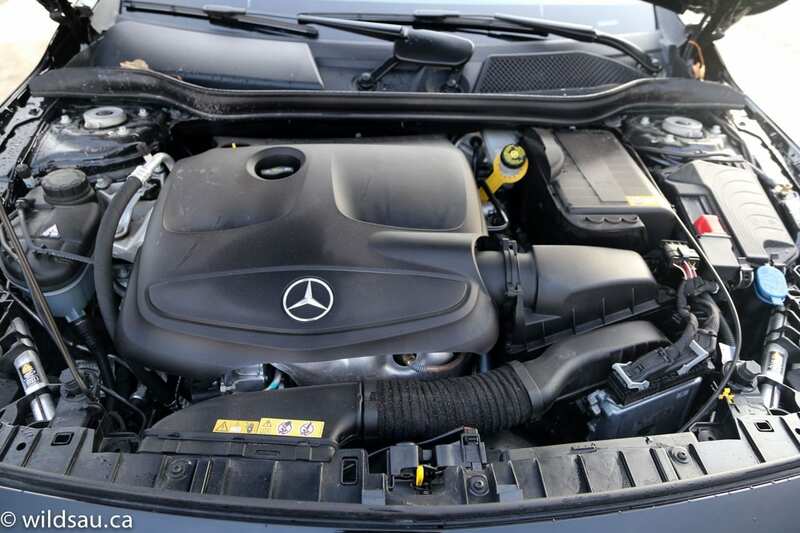 The little 2.0-litre makes plenty of torque that’s available almost immediately and it’s enough to propel the 3318 pound (1505 kg) GLA from 0-100 km/h in 7.1 seconds but the seat-of-the-pants feel is definitely faster than that. Acceleration is smooth with no perceptible lag or hesitation. The transmission seems to be programmed a bit more aggressively than the B 250’s in that it’s not quite as eager to continue shifting to the highest possible gear. That’s nice because the engine isn’t always lugging around town in the low 1000 RPMs. Yes, that kind of thing is good for fuel efficiency, but it gets a bit taxing when you’re always waiting for a 2-3 gear downshift when you need to move things along and I liked how the GLA goes about things. 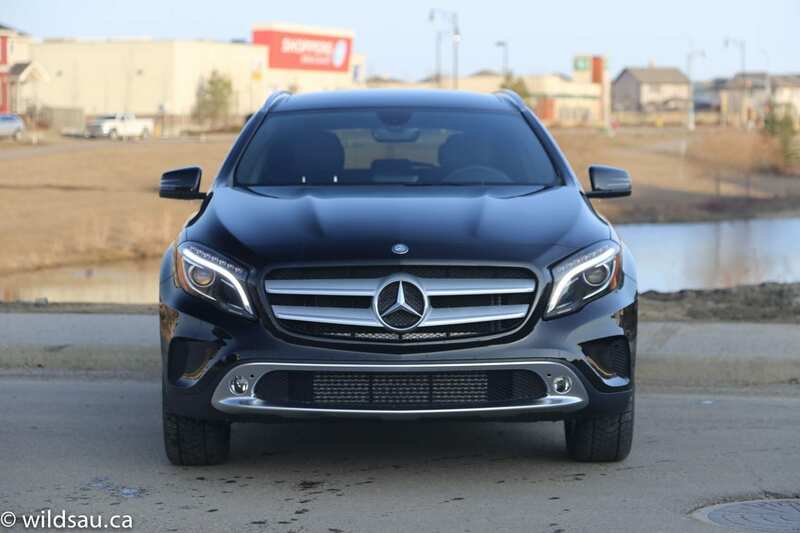 The transmission shifts very smoothly, and in Sport mode, it happily holds on to gears longer – coupled with a more responsive gas pedal, this mode transforms the GLA into a little sports car. Gears can be selected manually using the paddles and shifts are pretty quick. 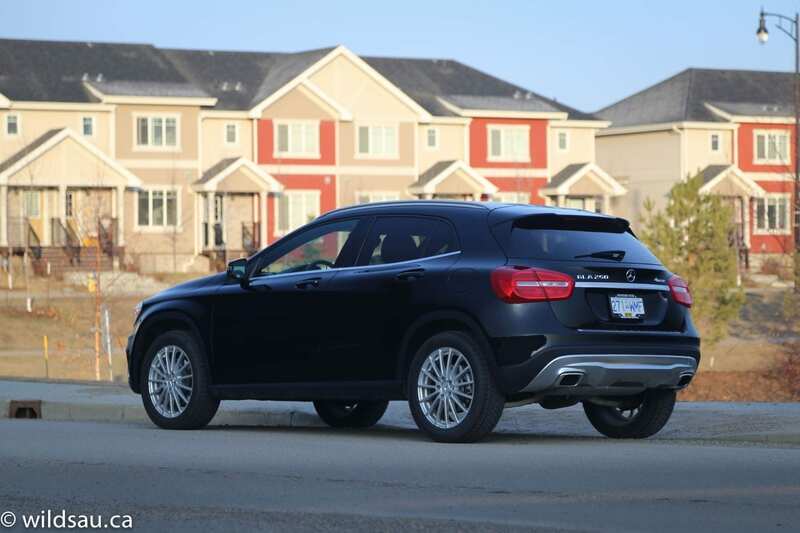 The GLA’s handling is very secure and competent with surprisingly quick turn-in and very little body lean. The ride, while sporty and European-firm, is very comfortable. I wouldn’t say it’s luxurious but it suits the vehicle’s character. 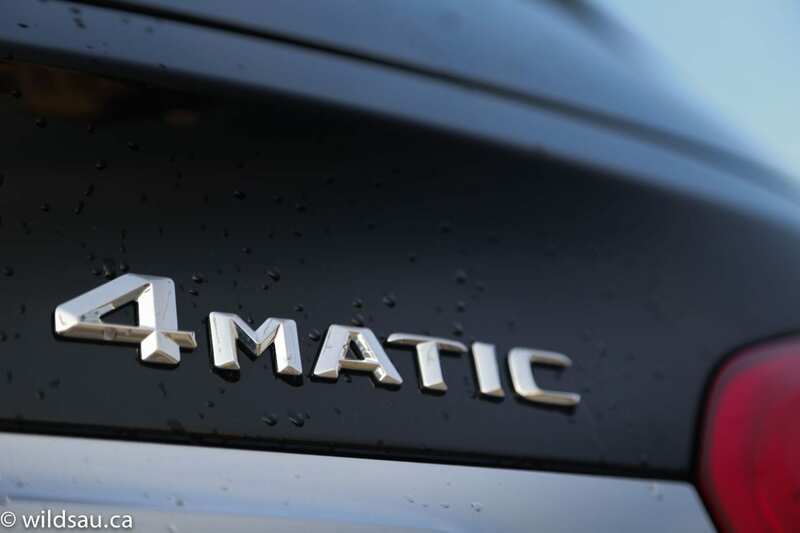 The 4Matic all-wheel drive is front-wheel drive based, but reacts extremely quickly, and we found it quite effective in the surprise spring snowfalls we experienced. 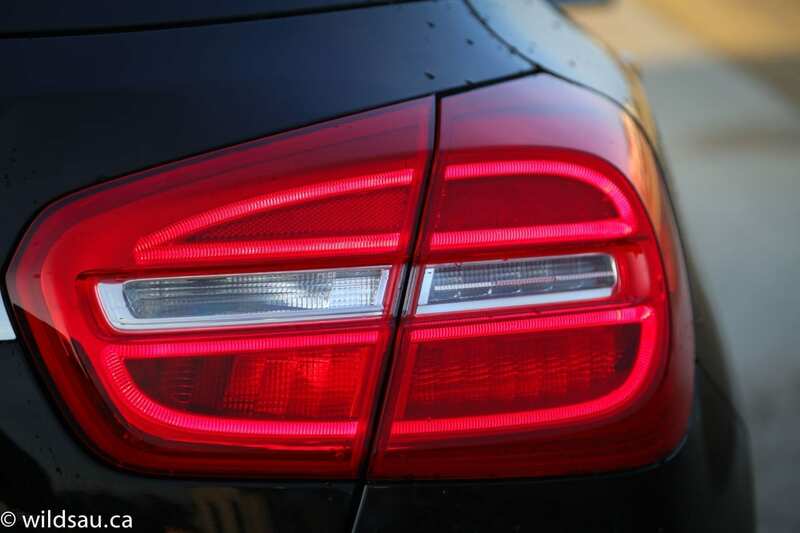 In dry driving conditions, it remains relatively invisible unless you’re pushing the car hard. Then it kicks in to really stabilize the driving experience. I found it was a very effective system overall. 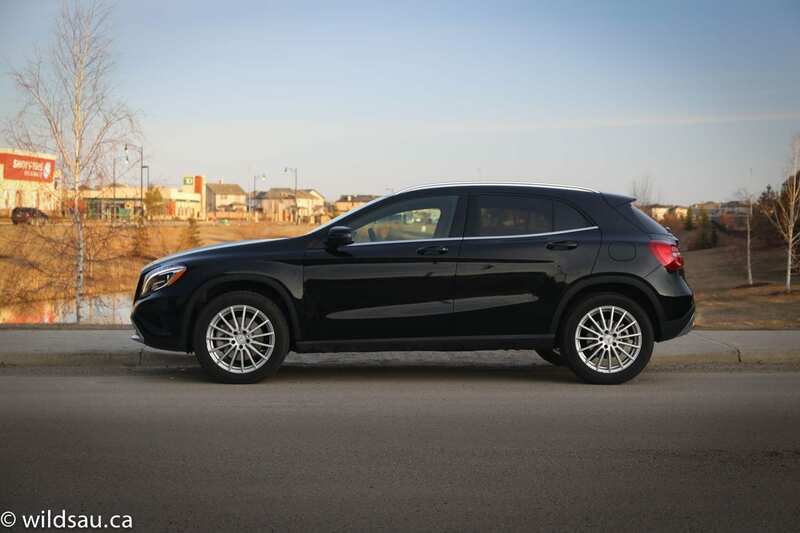 As with the other vehicles that share this drivetrain, the GLA has start-stop technology that will shut the engine off when you come to a stop. It’s defeatable, but you have to turn it off every time you start it up. I found it more intrusive than most systems, and you can definitely feel it start up the engine. I preferred driving without it. 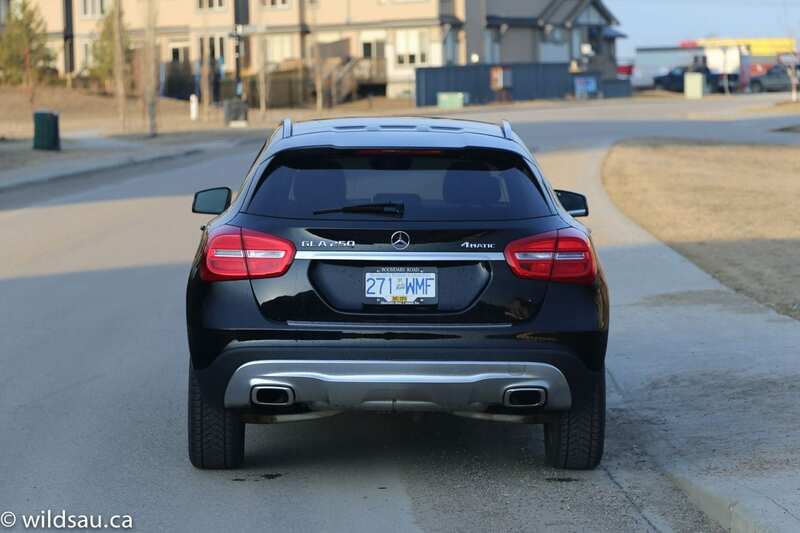 I thought the rear visibility out of the GLA was not that great, especially when it comes to shoulder-checking. 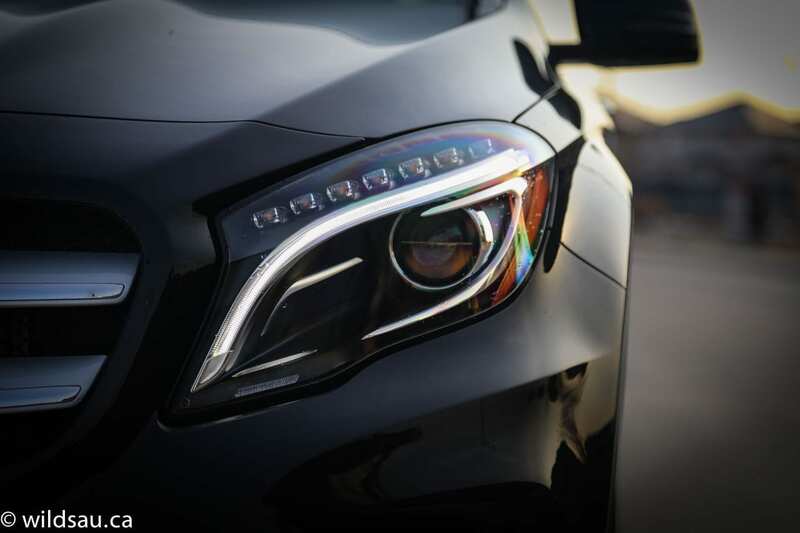 Mercedes adds what will likely be a very infrequently used feature on the GLA – On/Off-Road function, which modifies the vehicle’s shift points, accelerator response and ABS to optimize traction, especially on loose surfaces. 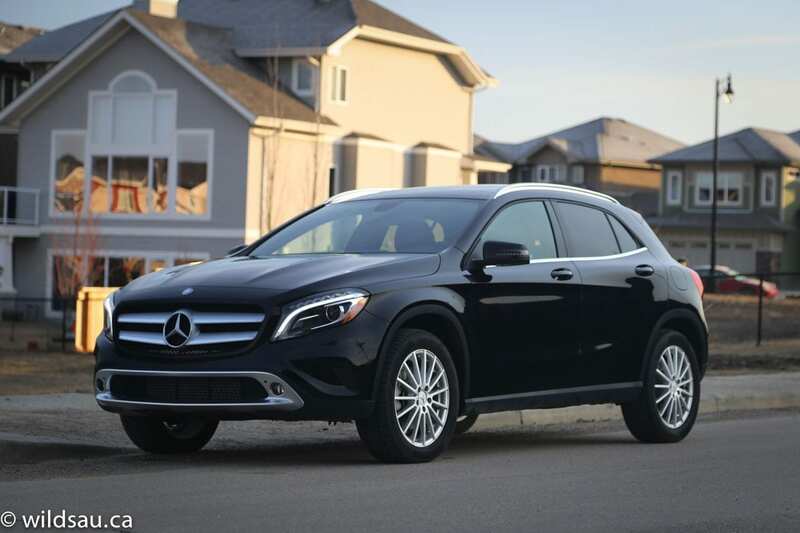 It also has hill descent control for the off-roading you’re sure to do with your GLA. While the B-class is more practical in terms of space and utility, and it’s now available with all-wheel drive, it’s a body style that isn’t nearly as popular here as it is in Europe. The B-class is the best selling class of Mercedes in Europe – not so here. 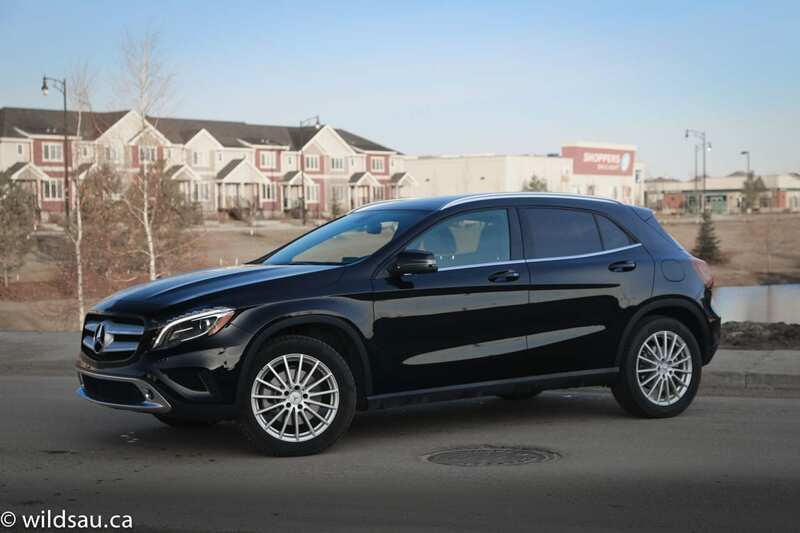 We love anything but wagons and hatchbacks here, and I think the cross-over vibe the GLA emits is exactly what potential B-class buyers in North America were waiting for. WAF (Wife Acceptance Factor) was … well, let’s just say we might be shopping for a new vehicle. While she absolutely loves her B 250, she said this might be one of the very few vehicles she’d consider trading it in for. She loved that it felt much like her B-class, and had a very similar interior. She really enjoyed the styling too, and overall the entire vehicle resonated with her very well. I really liked the GLA. It looks great and it looks different. 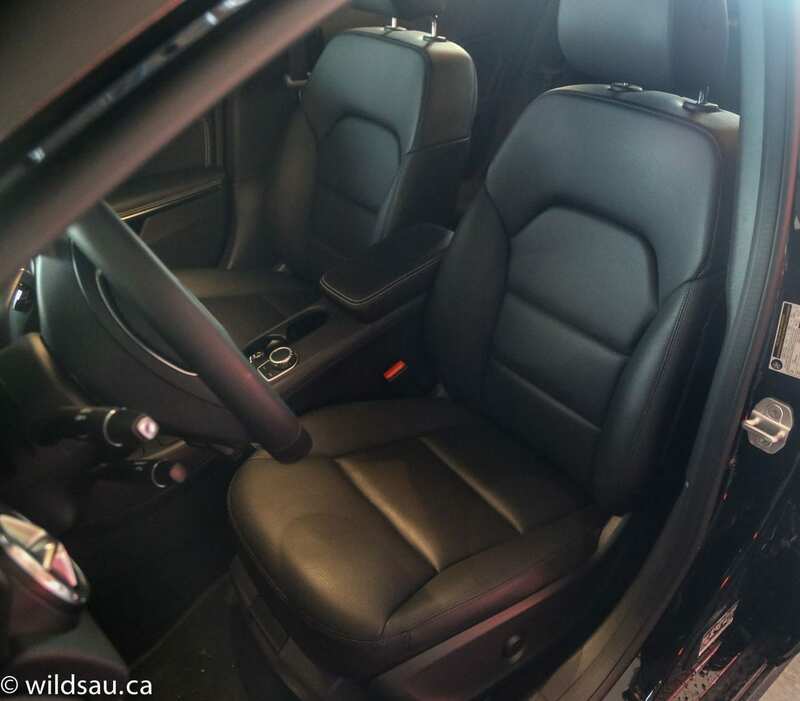 The interior is well-designed and has a premium feel to it. The driving experience is rewarding and it would be a vehicle that’s as easy to commute with on a daily basis as it would be to take on a road trip. Add to that a reasonable starting price that lets you get into a vehicle with the cachet of the three-pointed star and there’s a lot to like here. I think Mercedes-Benz will do well with the GLA. Sounds like my wife might be an early adopter of this brand-new model. Happy wife, happy life, right?